Can the Lyon family get together and draw viewers back into watching their TV show? Has the Empire TV show been cancelled or renewed for a sixth season on FOX? The television vulture is watching for the latest cancellation and renewal news, so this page is the place to track the status of Empire, season six. Bookmark it, or subscribe for the latest updates. Remember, the television vulture is watching your shows. Are you? Airing on the FOX television network, Empire stars Terrence Howard, Taraji P. Henson, Bryshere Y. Gray, Jussie Smollett, Trai Byers, Gabourey Sidibe, Ta’Rhonda Jones, Serayah, Andre Royo, Rhyon Nicole Brown, and Nicole Ari Parker. 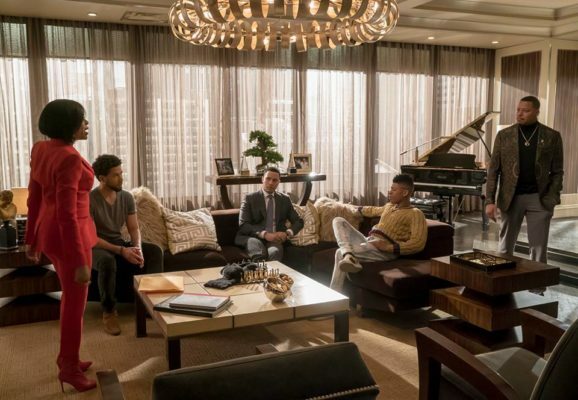 The series revolves around the Empire Entertainment company, founder Lucious Lyon (Howard), his three sons (Gray, Smollett, and Byers), and their mother, Cookie (Henson). The Lyons lost the company in season four and season five finds the clan still trying to reclaim Empire two years later. The fifth season of Empire on FOX is averaging a 1.39 rating in the 18-49 demographic and 4.65 million viewers. Compared to season four, that’s down by 25% and 18%, respectively. Find out how Empire stacks up against the other FOX TV shows. As of April 25, 2019, Empire has not been cancelled or renewed for a sixth season. Stay tuned for further updates. Will FOX cancel or renew Empire for season six? Though they are down, the ratings are still the strongest of FOX’s shows. Given the state of the rest of FOX’s slate, I have no doubt it will be renewed (despite the controversy surrounding Smollett). I’ll keep an eye on the Nielsens and update this page with breaking developments. Subscribe for free Empire cancellation and renewal alerts. TV show ratings are still important. Follow Empire’s weekly ups and downs. Find more Empire TV series news or other FOX TV show news. What do you think? Do you hope the Empire TV show will be renewed for a sixth season? How would you feel if FOX cancelled this TV series, instead? More about: Empire, Empire: canceled or renewed?, Empire: ratings, FOX TV shows: canceled or renewed? Empire: Cancelled or Renewed for Season Four on FOX? Just find a replacement for this guy Jussie. He is a huge liar as well as a embarrassment. Just fire him No reason for the entire cast to lose there jobs. You know they are going to rehire Jussie back. This PC crap irritates the **** right out of me. If they hire him back the show should be cancelled. I love Empire, as does my husband. We are faithful Empire fans. We will continue to watch Empire. There is no reason to punish the cast for Jussie’s actions. Everyone knows he’s guilty, so I am hoping they let Jussie go. After all, he is the reason ratings are down! Well I’m hoping that it gets renewed. I appreciate all of the hard work and time the cast and crew put in to this show. Its still exciting and unique and I seriously would miss Terrence and Taraji on my tv. Can everyone stop trying to punish the whole damn process. Bye Jussie if it gets to that but I’d still watch the show. I do not plan to watch Empire if Smollett returns. Done with this show. It belongs in the trash along with Smollet. Cancel it- unrealistic portrayal of lifestyle. Jussie Smollett needs to snap out of it! I did like watching the show, however, if Jussie Smollet is back on, I will definitely not watch again! He’s a complete disgrace!!! !